A Wall is a Screen – registered as a non-profit association – has in the meantime celebrated its 222nd performance and toured in 27 countries. This non-commercial cultural project has set itself the goal of “repurposing public space,” says Schwarz. And at the same time it also tackles such issues as public participation. “We convey the message to the people that – this is your city.” The films should be somehow in line with the places they are being shown in. For example, the group projected the film On a Wednesday Night in Tokyo (2004) by Jan Verbeek several times in underground stations, because the seven-minute-long film shows Japanese commuters being crammed into an underground train compartment that is already bursting at the seams. This led to a stimulating merging of film image and the real-life scene. Whenever the members of A Wall is a Screen travel to performances at home and abroad, they take an arsenal of about 800 short films with them in order to be able to adapt their program flexibly. With their idea to “light up” the city, the group in Hamburg were real pioneers in the field of mobile cinema. In the meantime, however, a large number of related initiatives have got off the ground in other big German cities. 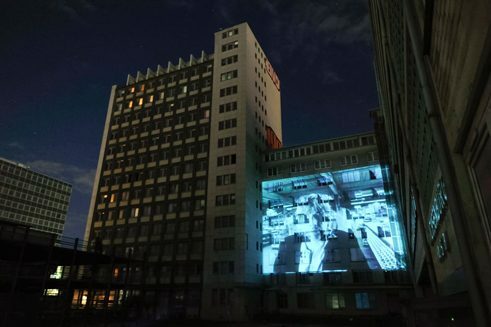 In Berlin, for example, there is a group called Mobile Kino, made up of former film projectionists and cinema operators, that enlivens the city’s urban spaces with digital film performances – especially the area along the banks of the river Spree. The dates and times of the performances are announced in advance on Facebook. Werner Kantor is a qualified camera man, living in Berlin, who is also on the lookout for places where his Nomadenkino can show films – films that are particularly appealing to a young, urban audience. The Kater Holzig Club and the Platoon Kunsthalle in the Prenzlauer Berg district to name but a few of his venues. It is in fact the charm of guerrilla cinema with its atmosphere of the mysterious and the unusual that keeps initiatives like these alive. In contrast, the project run by Tobias Rank and Gunthard Stephan called Wanderkino – Laster der Nacht (Travelling Cinema – Lorries in the Night) focuses in many ways on the early days of cinema. On the one hand, the films are all silent films, they are projected onto a screen stretched over the side of a lorry and they are musically accompanied by violin and piano. On the other hand, their company is following in the footsteps of traditional travelling cinema that became popular around the end of the 19th century – before cinemas became permanently established institutions. Every year Rank and Stephan appear at the Open Air Season in Clara Zetkin Park in their hometown of Leipzig – before an audience of up to 400 people. There have also been other performances, for example, in clearings in forests and in cemeteries. The films are projected on 16mm film – “After all we want to give people a real movie experience,” says Rank. Flexibles Flimmern (Flexible Flickerings) is what Holger Kraus from Hamburg calls his project – a project that since 2006 has enabled him, two or three times a month, to discover some quite extraordinary locations for his mobile cinema. It all started with a performance of Tomas Vinterberg’s Dogma film, Das Fest (The Celebration, 1998), in the now-demolished Kallmorgen mansion in Hamburg. Kraus, a movie buff and trained event manager, who in his former jobs did not manage to find any meaning, recreated the scenes from the film in the former home of the architect’s family. He sat with the rest of the audience at a long table – like the family in Vinterberg’s drama about abuse. Kraus knows a lot about how to stage events. The impulse for Flexibles Flimmern came about mainly from the desire for some kind of social exchange on a larger scale. “The social side of cinema is what sparked the whole thing off,” says Kraus. His performances, which are mostly geared to an audience of 100, also have political aspirations, alongside the event aspect. This was clear, for example, when he showed the film Burma VJ (2008) by Anders Østergaard in a news program of a Hamburg TV station. Burma VJ is a film about journalists who risk their lives, smuggling film material out of Burma. Patrick Wildermann is a freelance cultural journalist based in Berlin.